How would you feel if you could do something to help Georgia’s rare animals? The students’ answer was unanimous and excited: We want to help! And they have. 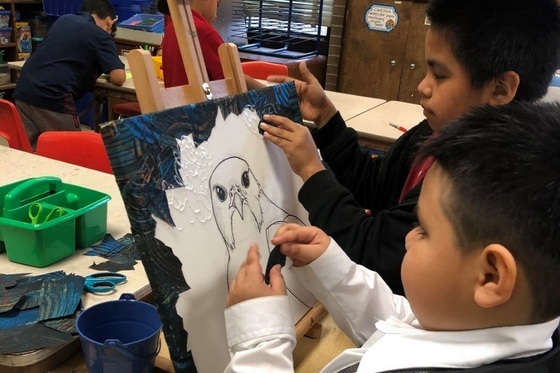 Through the Kingsley Cares: Save Georgia Wildlife Project created by Lubin, each student created a poster for the Give Wildlife a Chance Poster Contest and each class made a painted paper collage of a native animal. The collages were then auctioned as part of the Dunwoody Nature Center’s Epic Earth Day event. Bids totaled $2,050. Sales of the 23 canvasses ranged from $50 to $250. All funds were donated to the center. The project integrated art, technology and science (Dunwoody Nature Center educators provided in-school programs), and math (students added, graphed and compared collage sales). The project also combined hands-on learning with a real-life contribution for conservation. Lubin said with a laugh that the scope was “a little intense” and involved a learning curve. But she’s already exploring plans for next year. Included: Starting a Kingsley Cares: Protect Wildlife Club. 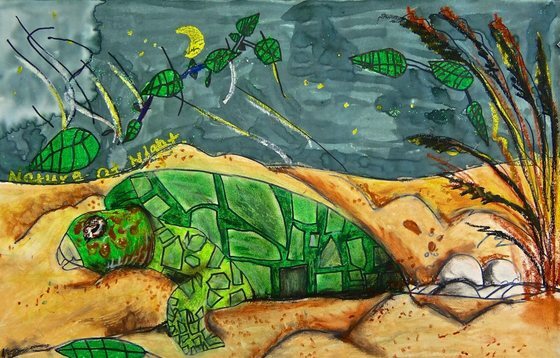 Check out the news and see the artwork of statewide winners in the Give Wildlife a Chance Poster Contest. The posters also are on display at the State Botanical Garden in Athens through May 16. One of the world’s longest migrations is taking place in our backyards. And you can take part in it. Each year, millions of monarch butterflies fly 3,000 miles across North America. The round-trip from as far north as Canada to as far south as Mexico can take four generations to complete. Not surprisingly, the monarch has many secrets that scientists are studying. For example, while some areas where the butterflies overwinter are well-known – such as southern California and Mexico – biologists are trying to determine if a population winters on Georgia’s coast, and whether that is a product of environmental change. 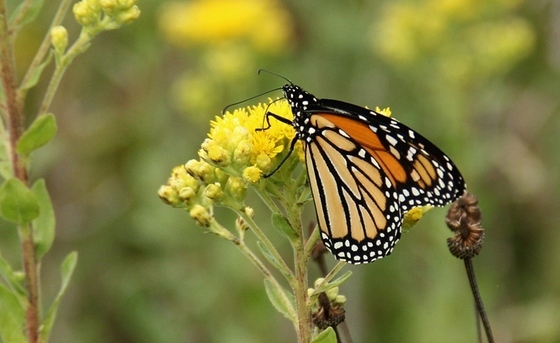 This research is spurred by concern that monarchs are declining. Which is where citizen science comes in. Because monarchs live throughout Georgia and are hard to track, public involvement in local conservation efforts and research can have a significant impact. What can you do? Plant flowers that provide nectar for adult monarchs and vegetation for the caterpillars to eat. Monarch adults are generalist foragers. If your yard has a variety of native blooms through the growing season, these butterflies will come. Yet the only plant monarch larvae feed on is milkweed. There are several species of milkweed. Selecting the species that naturally occurs in your area of the state is important. Learn more in this brochure. Citizens can also help with research. In late April, DNR held a training session in Brunswick focused on the Integrated Monarch Monitoring Protocol. This national method is being used to compile baseline data for research. Another session is scheduled for June 7-8 at Panola Mountain State Park near Stockbridge. Register here or email for more information. Whenever we talk about what makes spring such a beautiful time, invariably the discussion centers on the pleasing scent and kaleidoscope of colors displayed by spring flowers, the fresh, pale green of the foliage, and the pleasant weather. But what's rarely mentioned is the dawn chorus by some of the bird world's most accomplished vocalists. While this might seem odd – this is Mother Nature's top musical production of the year – I’m certain the oversight is because the songfest happens before most Georgians stumble out of bed. Read the rest of Terry’s column to learn better appreciate spring’s dawn chorus. Four anglers returning from fishing the CCA-JL reef on Dec. 19 had an unforgettable encounter – one that has since been linked to a widely watched video. About 10 miles east of Ossabaw Sound, Todd and Tanner Hicks, Garrett Franzel, and Ennis Hager spotted a humpback whale. 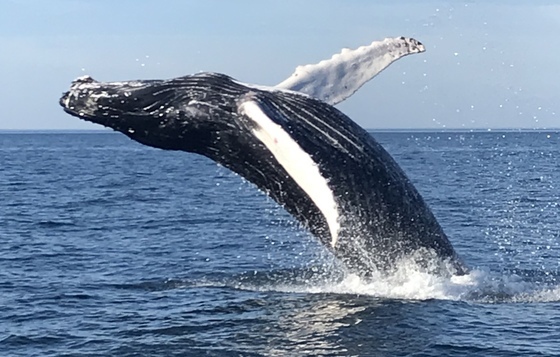 Keeping a safe distance away, they watched as the nearly 30-foot-long whale breached “about every two minutes” and flapped its tail for almost an hour, said Todd Hicks, of Richmond Hill. The experience points to a real trend: Humpback whale sightings are up in the Southeast. But it also has a sobering end. Two months later, the humpback was found dead off Cumberland Island, where DNR videoed sharks scavenging the carcass. Scientists monitoring North Atlantic right whales reported 43 humpback sightings and at least 16 individual whales off Georgia and Florida this winter, according to Melanie White, a biologist with Sea to Shore Alliance. 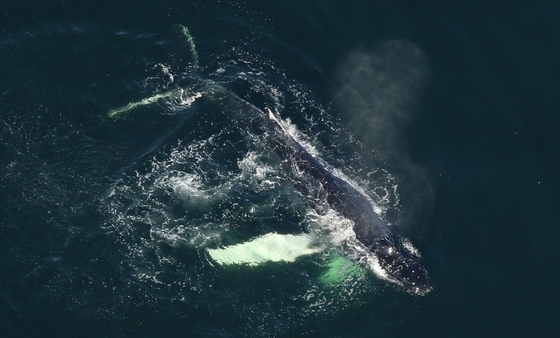 The nonprofit focused on conserving coastal environments and species leads right whale aerial surveys each winter for DNR’s Nongame Conservation Section. “While it is not unusual to spot humpback whales, their sighting numbers have definitely increased in recent years,” White said. North Atlantic right whales, one of the world’s most imperiled whale species, remain the focus in the Southeast. Yet humpbacks are showing up more often. Particularly young ones. Why isn’t known. Humpbacks along the Eastern Seaboard are part of a West Indies population that spends summers in the North Atlantic and each winter breeds in warm Caribbean waters. Yet their migration is thought to occur far offshore. Hunted nearly to extinction, these whales known for their leaping, singing and up to 15-foot-long white flippers were listed as endangered in 1970. However, over the next four decades they recovered (related: humpback baby boom near Antarctica). Nine of 14 distinct populations worldwide – including the West Indies segment – were taken off the Endangered Species Act list in 2016. 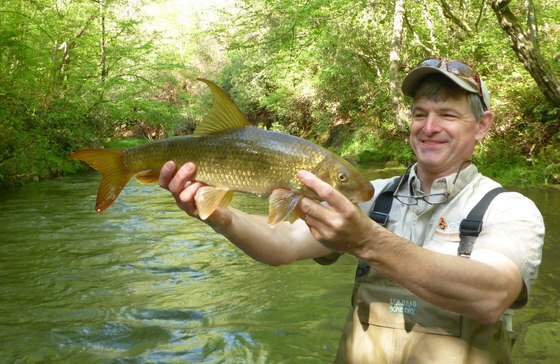 Georgia may be seeing the overflow of that conservation success. Boaters and anglers should be on the lookout, especially in winter and spring. Unlike right whales, humpbacks sometimes swim close to shore. Sightings have been documented off Georgia as late as May. But how did the humpback seen breaching in December end up as food for sharks in February? Entanglement might have played a part. Six months ago, the whale – then just a calf – was photographed off Massachusetts with monofilament gillnet in its mouth. 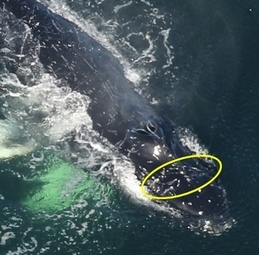 As with right whales, entanglement in commercial fishing gear is a threat for humpbacks. Two days before the Georgia anglers saw the humpback, the Florida Fish and Wildlife Conservation Commission spotted it off Ponte Vedra Beach in northeast Florida. Researchers will be checking images taken by the fishermen for evidence of entanglement. They believe the whale may have shed the rest of the gillnet between December and February. But it was likely too little, too late. When FWC staff saw the humpback again, on Feb. 24 some 30 miles off Cumberland Island, it was dead. DNR later videoed great whites and other sharks eating the carcass. Media outlets from the U.S. to the United Kingdom carried the video. Protected: under the Marine Mammal Protection Act of 1973. Boaters and others remain at least 100 yards away (marine wildlife viewing guidelines). Generalist vs. specialist species: Humpbacks, an example of a generalist species, eat a wide range of foods (including fish). A specialist species such as the North Atlantic right whale has a more focused diet (primarily tiny crustaceans called copepods). For the fifth straight year, Cumberland Island has reported Georgia's first loggerhead sea turtle nest of the year. National Park Service staff found the nest Tuesday morning. DNR Sea Turtle Program Coordinator Mark Dodd said loggerhead nesting usually begins in early May and hits full stride by June. The Georgia Outdoor Stewardship Act will be on the statewide ballot in November. This week, Gov. Nathan Deal signed the constitutional amendment (photo) allowing voters to decide whether to dedicate a share of the sales tax on recreational items to conserve the state's wildlife, lands and waters. Birds and birders won during the 13th annual Youth Birding Competition April 27-28. The five teens on the winning team, the Wood Thrushes, saw or heard 161 species during the 24-hour contest. The first 500 youth at the Keeping Georgia Wild festival May 19 will get a T-shirt. But all attending the free fest at Charlie Elliott Wildlife Center near Mansfield can try activities varying from archery and fishing to shooting sports and tree climbing. Also: kids fishing events near you. DNR burn boss Shan Cammack (far left), State Parks staff and the south Georgia seasonal fire crew treated 200 acres at Seminole State Park near Bainbridge with prescribed fire. 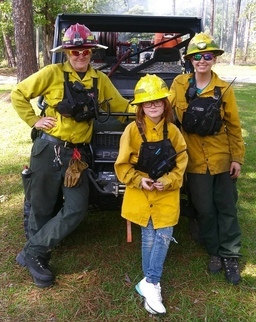 They also reached out to the next generation of wildland firefighters, mentoring Katie, a second-grader, on the habitat-boosting burns. Do the three-step to give online to Georgia’s Nongame Wildlife Conservation Fund at www.gooutdoorsgeorgia.com. 1. Click “licenses & permits.” 2. Log in. (Review and certify your details. No account? Click to create.) 3. 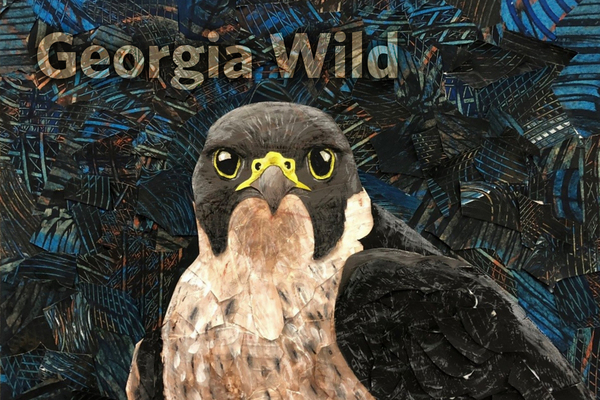 Pick the Keep Georgia Wild package or scroll down for donation options. (At checkout, license purchases and renewals also can be rounded for wildlife.) FAQ: Do I have to buy a license? No, but license sales benefit wildlife in a big way. The osprey nest live-streamed on Skidaway Island has only one chick after the younger sibling died of unknown causes May 2. Last year, the nest’s only chick was attacked and killed by an intruding adult osprey. In the news: osprey eggs returned to Savannah nest on light pole. Longleaf pine restoration at Yuchi Wildlife Management Area near Waynesboro apparently suits wild turkeys. 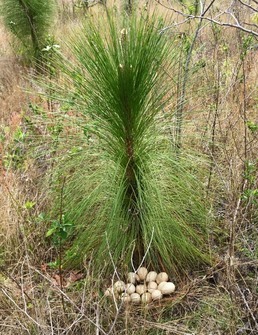 One hen laid her eggs beside the young longleaf at left. Learn more: how growing-season burns benefit nesting birds. With bears on the move during spring, an education program called BearWise is informing Georgians how to avoid problems and help keep bears wild. Read the BearWise basics. More on nuisance wildlife. Georgia beaches are not only vacation hotspots, in spring and summer they’re top spots for nesting shorebirds and seabirds, and for migrating species fueling up for long-distance flights to the Arctic. Here’s how to share the beach this summer. The world’s oldest known spider, an Australian trapdoor spider, is dead at the age of 43. Georgia is also home to trapdoor species, ground-dwellers related to tarantulas (“Impressive mygalomorphs,” April 10). Barking up the right arm? 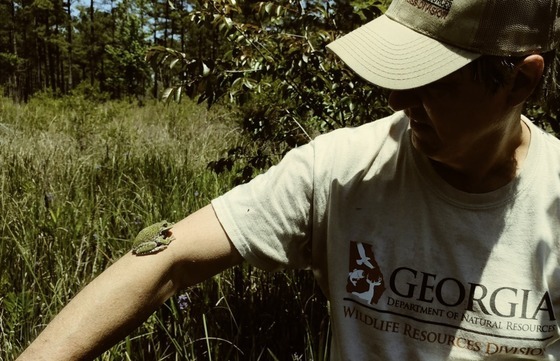 Below, senior wildlife biologist John Jensen shows a barking treefrog found while collecting wetland plants at Mayhaw Wildlife Management Area for The Amphibian Foundation’s flatwoods salamander breeding program at Blue Heron Nature Preserve. May 11 – Bird banding, 5:30 a.m. Panola Mountain State Park, Stockbridge. Other dates include: 5:15 a.m. May 26, 5:15 a.m. June 7 and 22. Details: Georgia Important Bird Areas Program Coordinator Charlie Muise. May 19 – Keeping Georgia Wild Family Festival, 10 a.m.-2 p.m., Charlie Elliott Wildlife Festival, Mansfield. Free. Includes archery, fishing, shooting sports, gun safety, mini-boat rides, solar viewing, outdoor exhibitors, wildlife demonstrations. 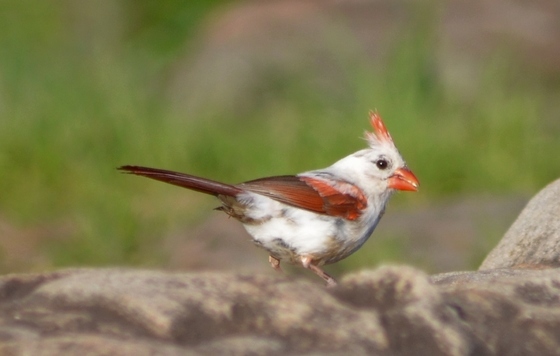 This leucistic cardinal has been turning heads at Kennesaw Mountain National Battlefield Park. 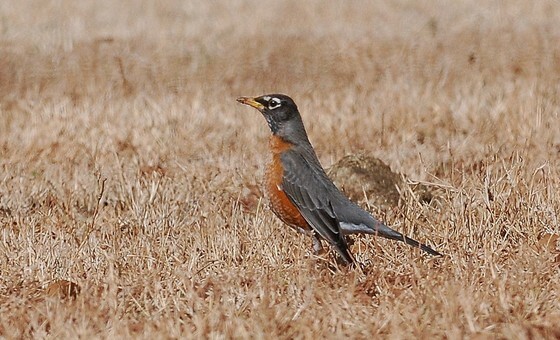 Evan Schneider of Macon took the photograph during a recent birding trip to the Kennesaw park. Leucism is a condition involving the partial loss of pigmentation – turning, for example, bold red to patchy white – but not affecting pigment cells in the eyes (unlike with albinism). A genetic mutation that renders pigments derived from food yellow instead of red likely produced the yellow northern cardinal that caused a stir near Birmingham, Ala., this winter.